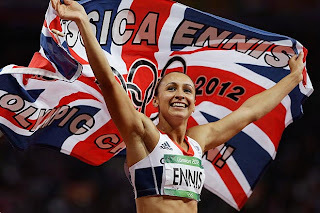 Jessica Ennis (Team GB) will be remembered for her convincing heptathlon victory at the London 2012 Olympics. I was glued to her final 800m race last weekend, even though I am a sports novice, and even though, due to a massive points lead, Jessica didn’t even need to win the race to get the gold medal. If committed until the end, she could simply turn up, run the race to completion and claim the victory. The bible describes living life as a Christian to be ‘running the race’, and during the course of the Olympics this metaphor particularly has captured my attention. What does it mean, to ‘run the race’ if doing so is to live the life God wants for us? The hepathlon victory for Jessica Ennis, given her points history, was almost a certainty. The race was essentially already won, yet she showed she wasn’t content to win in third place as the athletes reached the final stretch. Knowing the outcome ahead must have given her confidence, and spurred her on to overtake her competitors and run as fast as she could to reach the finish line. If ever there is a race that has been won before it has even begun, it is the ‘race’ marked out for the life of every Christian. It’s the sprint, or perhaps a steady marathon, between the ‘now’ and the ‘not yet’; we are called to turn from our old lives, throw off the sin that weighs us down, and run the race. This means giving up our old way of live and pressing on to put God above all else, and give him all the glory. If we need something to spur us on, there is the certainty of eternity already won for us by Jesus, our resultant identity as children of God and the promise of the Holy Spirit to help us live new lives shaped by Him. I’m weak-willed and I tire easily, but the beauty of living the Christian life is that the outcome is fixed - not dependent on my wavering commitment to the cause. I must, however, keep my eyes fixed on Jesus – on whom everything depends. I can’t stop running, and I can’t give up – but my determination shouldn’t come from guilt, duty or pride. The ‘not yet’ promised by God’s word is that the race will be finished, along with my sin and struggles, and that God’s glorious kingdom will come in power. My motivation must be Jesus, who said on the cross ‘it is finished’ and secured for me eternal hope– my faithlessness for his faithfulness and my sin for his righteousness. So, despite everything, I’m free to run the Christian race with freedom and without fear, assured that the victory is already mine in Jesus. Daily choices are mine to make, but my life has been bought at a price - I need to pray that my actions and words will be shaped by the spirit of this glorious God who will not let me give up.